As many of you know, Amazon (NASDAQ: AMZN) has its own Android based app store that offers a free app every day. The Kindle Fire is set to release on November 15 with a huge selection of popular apps including Pandora, Netflix, Facebook, and games from top gaming companies including Electronic Arts, PopCap and more. Amazon is set to go with everyone’s favorite apps right out of the gate. That’s pretty impressive considering how long it took the iPad to get a Facebook app. But, in Amazon’s case, a precedent has been set in the android market. Whereas the iPad was the first to enter the tablet market, and is the only tablet using Apple’s app store. EA and PopCap are known for high quality games. A few favorites include Scrabble, Tetris, and Peggle. Tetris has been a huge hit since the beginning of gaming systems. Rovio is also on board, and they’re the makers of the hit game Angry Birds. What is a tablet without Angry Birds? Netflix and Pandora are other top apps that are available across tablet and smartphone platforms, so they are a natural addition to the Kindle Fire collection. Amazon also has its own video streaming library for Amazon Prime members set to rival Netflix. Pandora and Rhapsody are the major players in music apps. As far as apps go, one niche that Apple has a good hold on is Accessibility. There are apps for the iPad that serve as decent and much cheaper alternatives to assistive technology. I just downloaded a magnfying glass and a recorder recently. There are also caption services, and so much more. I haven’t seen as much of this on Android systems, or on the Kindle in general. It would be great to see apps that help people with vision, hearing, mobility, and learning disabilities. Just another way to heat up the competition against Apple. For more information on what popular apps will be available on the Kindle Fire, check out the latest Amazon press release. The 2011 Book Expo America brought all kinds of exciting events and upcoming projects for the Amazon Kindle and others. Amazon Publishing offered author signing and interviews, Kindle excerpts and more. Amazon Publishing has a collection of free Kindle downloads that provide excerpts and teasers for upcoming releases. The new releases will be available in the Summer and Fall of 2011. Some full versions are available for preorder. This is a great opportunity to test drive some books and authors that you haven’t gotten a chance to try. We’ve already seen the competition heating up with the latest Nook releases. I actually got a chance to check ou the NookColor recently, and thought it was pretty decent. At the expo, Kobo introduced the new Kobo Touch. It depends mostly on touch screen with the exception of one home button at the bottom, which is similar to the iPad set up. Based on reviews, the Kobo touch looks pretty clean and can probably hold it’s own in the e-reader market. The Kobo may sound great in theory, but in order for it to be accessible, it’ll have to have some kind of voice navigation feature. Currently, the Kindle is way ahead of both the Nook and Kobo readers because of its accessibility features and text to speech option. The iPad also has a lot of great accessibility features of its own, however, the iPad will be more competitive with the rumored Kindle Tablet than the current Kindle e-reader. I decided to try my hand at publishing my blog on the Kindle Blog platform just to see what happens. Anyone can submit their blog through Amazon’s Blog Publishing platform as long the blog provides good quality content, and has a niche. 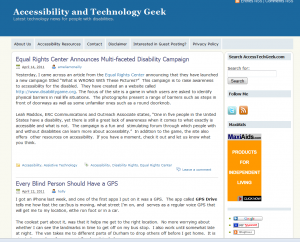 Accessibility and Technology Geek is a disability awareness blog. I write about how various devices such as the Kindle, iPhone, iPad, etc are being made accessible for people who have vision loss, hearing loss or mobility impairments. I have friends share their own personal thoughts and experiences so that the blog has a variety of different voices and viewpoints. The new gadgets, including the Kindle, can be considered assistive technology themselves, and have made great strides in recent years to allow people with disabilities to access them right along with everyone else. The Kindle includes large font sizes, audio, excellent text to background contrast, and an accessibility plugin for the Kindle for PC application. One of the reasons why I published AccessTechGeek to Kindle Blogs is to make the blog itself a lot more accessible. With the Kindle, it can be read anywhere. Plus, the Kindle fonts can be enlarged pretty big, so it is a easier reading experience. Sometimes I find that the glare of the computer screen can be really hard on my eyes. So, reading it on the Kindle can bring some relief. The blog content is updated daily. If you just want to give AccessTechGeek a trial run, there is a 14 day free trial for just signing up. When Amazon Kindle DX with 9.7″ eInk screen was announced it was dubbed “academic eReader”. Academic publications and textbooks don’t display well on a smaller 6″ screen. When the device was released, several universities and colleges announced pilot programs aimed at evaluating its effectiveness in replacing classic textbooks. However these programs hit the same roadblock everywhere: despite having Text-to-Speech capability (which not other eBook reader has), Kindle DX wasn’t accessible to vision-impaired students. This mostly had to do with the fact that menus and other controls don’t have audio. After this concern was raised repeatedly, Amazon (NASDAQ:AMZN) promised to address it in a software update that is expected to be publicly released in Q2 2010. As you know, this matter began with complaints filed by the National Federation of the Blind (NFB) and the American Council of the Blind (ACB) with the Department of Justice, on behalf of the organizations and their members who are current and prospective college students, alleging that Princeton University has violated title III of the Americans with Disabilities Act of 1990 (“ADA”), 42 U.S.C. § 12182, and Section 504 of the Rehabilitation Act of 1973, 29 U.S.C. 5 947(a), by using the Kindle DX, an innovative, hand-held electronic book reader that is not accessible to students with visual impairments, in a classroom setting. According to the complaints, Princeton University is offering a pilot program that began in the fall 2009 semester. The object of this pilot is to test the utility of the Kindle DX in a classroom setting. 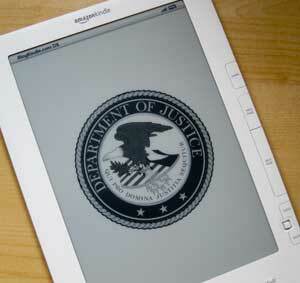 The Department of Justice is responsible for the enforcement and implementation of titles II and III of the ADA. The Department decided to investigate this matter because the Kindle DX is inaccessible to an entire class of individuals with disabilities – individuals with visual impairments. According to its product descriptions, the Kindle DX provides several benefits that make it a potentially superior tool to a standard textbook, including the ability to download all textbooks instantaneously, the ability to carry all textbooks on a hand-held device that weighs just over a pound, the ability to search words and concepts instantly on the device’s web browser, while retaining all the characteristics of a standard text book, such as annotating, highlighting, and taking notes. Under title III, blind students must be provided with “full and equal access” to all of the goods and services of the university, 28 C.F.R. § 36.201(a); must be provided with an equivalent opportunity to participate in and benefit from its goods and services, 28 C.F.R. § 36.202(a), (b); and, must not be provided different or separate accommodations unless doing so is necessary to ensure access to goods and services that is equally as effective as that provided to others, 28 C.F.R. 36.202(c). The Department acknowledges both that Princeton University denies any violation of the Americans with Disabilities Acts and that it has stated its commitment to ensuring equal access to educational programs, activities and opportunities for students with disabilities. Both the Department of Justice and Princeton University agree that the emergence of new electronic book reading technologies that benefit the sighted have the potential to benefit blind students and faculty as well. The Department of Justice and Princeton University have decided that it is in their interest to resolve this matter amicably. In consideration of the agreement by Princeton University to undertake the actions set forth below, the United States will close its investigation of this matter. The University will not require, purchase, or incorporate in its curriculum the Kindle DX or any other dedicated electronic book reader for use by students in its classes or other coursework unless or until such electronic book reader is fully accessible to individuals with visual impairments. Alternatively, Princeton may comply with the terms set forth in paragraph 5. The phrase “other dedicated electronic book reader” means any wireless, hand-held, electronic book reader that has been or will in the future be produced or offered by Amazon.com or any other corporation, such as but not limited to the Barnes and Noble nook, the Sony PRS-600, PRS-700, PRS 505 or upcoming Sony Daily Edition, and others. Princeton University will commit a policy reflecting the terms of this agreement to writing within 30 days of the date of the last signature below. Princeton University agrees that its commitments in paragraphs 1-4, herein, will, take effect on the date following the last day of the pilot project with Amazon.com, Inc., which will terminate no later than the conclusion of the fall 2009 semester,’and will remain in effect through June 30,2012. As a reasonable modification, the University may provide its students with visual impairments with a dedicated electronic book reader that ensures that individuals who are blind or have low vision are able to access and acquire the same information, engage in the same interactions, and enjoy the same services as sighted individuals with substantially equivalent ease of use. This agreement does not constitute a finding by the United States that Princeton is in full compliance with the ADA, or an admission by Princeton University of fault or noncompliance with the ADA. This letter agreement does not alter nor enlarge the legal obligations of the University, and shall not form the basis for any enforcement action against Princeton University. The decision to close our file in this matter does not affect the rights of private individuals or of the complainants to enforce their rights under the ADA against Princeton University. As indicated in paragraph 4, above, this agreement also has no effect on Princeton University’s current pilot program testing the Kindle DX. Please countersign and return a copy of this letter to us, indicating your agreement with the representations and terms set forth herein. Once we have received your countersigned copy, we will consider this matter resolved. We will take no further action on this matter unless we become aware of new information suggesting that Princeton is not complying with its obligations under the ADA or this agreement. We appreciate your cooperation. If you have questions or concerns regarding this agreement, please do not hesitate to contact the Department. Personally, I believe that eBooks and eReaders are the future of education and when done properly they can provide levels of accessibility previously unobtainable. Hopefully the software updates will be released soon and XXI century publishing can finally happen for textbooks. Since the Kindle was introduced in 2007, it has eased the burden on visually impaired readers considerably by incorporating six font size adjustment options. The font size adjustment on the Kindle is a great feature because it eliminates the need to buy heavy, cumbersome large print books. Large print books are often very expensive and are not readily available. However, more can be done to make reading more pleasurable for this group of readers. In addition to large print books, visually impaired readers use another device called a CCTV. A visually impaired user uses a CCTV to enlarge the font on her book. These devices tend to run in the $4000 price range, which is a pretty hefty price tag. The reader places the book on a platform under a computer screen and adjusts the font size and color schemes to fit their reading needs. If the Kindle can include more font sizes into its options available, just imagine how much easier, less expensive and more portable reading would be for these readers! The dream takes a closer step towards reality this summer. Amazon plans to make more font size options available during the summer of 2010, according to this WebProNews article . The amount of font size options will increase from six to eleven. The seventh font option, a “super font”, will be double the size of the largest font size currently available on the Kindle. At last, visually impaired users will be able read with comfort and not have to worry about eye strain and muscle soreness from lugging a large book around. 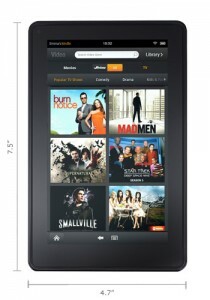 The expense of purchasing large equipment such as the CCTV will be drastically cut by purchasing a $259 Kindle. Arizona State University is one of six schools of higher education that are planning to deploy the Kindle DX this fall. They are, however, coming under fire from both the National Federation of the Blind and the American Council of the Blind over its use. The two organizations have jointly filed suit against ASU in an attempt to stop the Kindle’s planned usage. While the Kindle does include a text-to-speech feature, all menus and navigation, including the ability to activate text-to-speech, are completely inaccessible to blind students. According to the lawsuit, if any University uses the Kindle as their primary means of textbook distribution, it is in clear violation of federal accessibility standards. A press release detailing the plaintiff’s position can be found here. Public Universities, being governmental institutions, are required by federal law to meet strict guidelines regarding accessibility. Since the Kindle clearly does not meet these guidelines, there only seems to be two possible ways this could turn out: Either ASU (and the five other schools) cancel their plans to use the Kindle, or Amazon releases an update which adds accessibility features to the Kindle Store and menus. It would be a relatively simple software change for Amazon to make, so hopefully that is the route that things take. Then, the only problem would be the legal issues surrounding text-to-speech itself.